When I saw drumstick leaves in a near by market recently I picked them as I rarely find them.I like the flavor of those greens especially when made in curries/palyas. Drumstick leaves are known to have more iron content in them and hence is very healthy to consume these greens once in a while.For a change I wanted to make something different apart from the usual palya/powder recipes with them.I usually add the tender ones in akki rotti but had not given a try in dosa/adai. I have adapted this recipe from a cook book with some minor changes to suit our taste buds.The adai was tasty with a nice flavor added from those drumstick greens and over all a healthy dish.I like the combination of adai with jaggery and ghee and I know many of you think it is a weird combination,but for me the crispy and spicy adai tasted nice with jaggery and ghee.Who knows?? you might also fall in love with that combination,give a try and lemme know how you liked it. Soak rice for 3-4 hrs and toor dal for 1 hr separately. In a blender/mixer,grind rice with toor dal,garted coconut,red chillies.cumin seeds,asafoetida,curry leaves and salt to a rawa consitency batter.Try adding less water for grinding,the consistency of the batter should be similar to the idli batter,but a bit coarse in texture. 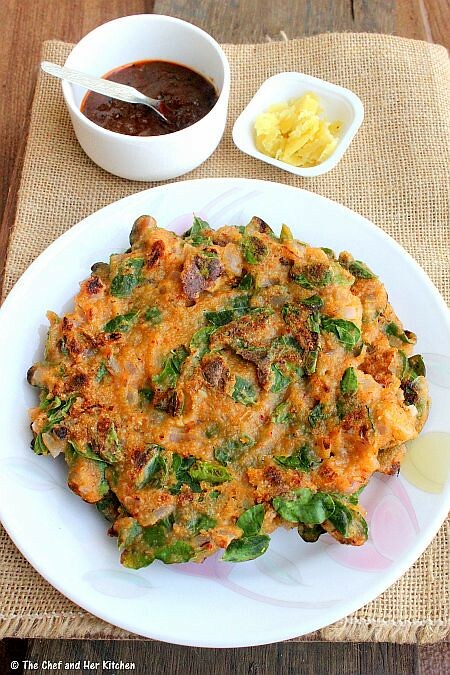 Leave the batter aside for an hour or two.However it is optional,you can make adai immediately with the batter. Clean and remove the drumstick leaves from the stems.Wash and drain them. 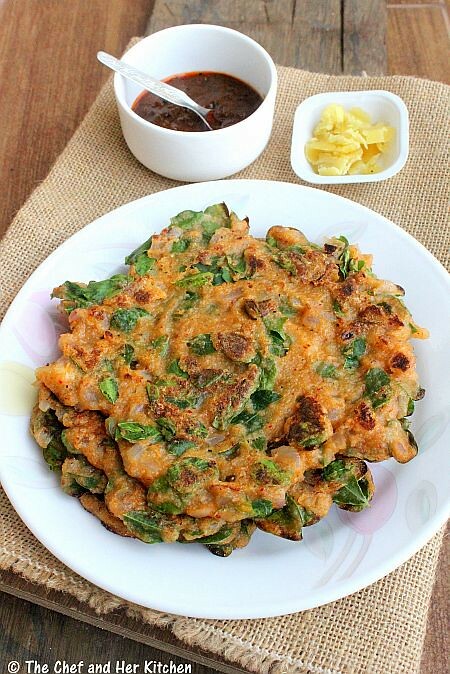 Add finely chopped onions/shallots and drumstick leaves to the batter,the batter would be thicker than the spreading consistency.Do not chop the drumstick leaves. Make small and slightly thicker adai like how we spread dosa.Do not bother about the shapes of adai,as the batter is very thick it is bit difficult to get the perfect round shape but taste wise there would not be any difference. Pour lots of oil all over the adai and in the corners.It makes the adai more crispier. Cover and cook it over low-medium flame until golden brown on one side which takes 1-2 mins ideally.Turn to the other side and roast it well.Turn back to the roasted side and increase the flame for 1/2 minute. Serve them hot with spicy Onion chutney,Jaggery and Ghee. You can even serve with Avial/Onion-Tomato chutney/Ginger chutney or Coconut chutney. 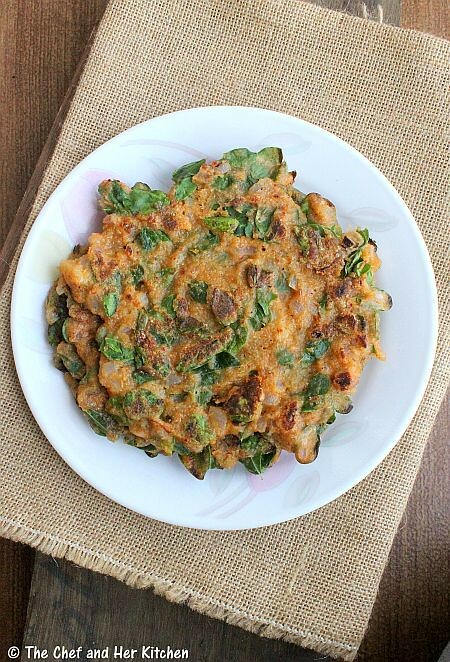 Use tender drumstick greens for this adai as they have lots of flavor in it. Adai is ideally prepared thicker and also needs lots of oil to fry,so please add more oil for a crispier and tasty adai. You can use 2 cups of raw rice instead of 1 cup raw rice and 1 cup of idli rice.But idli rice makes the adai more crispier. 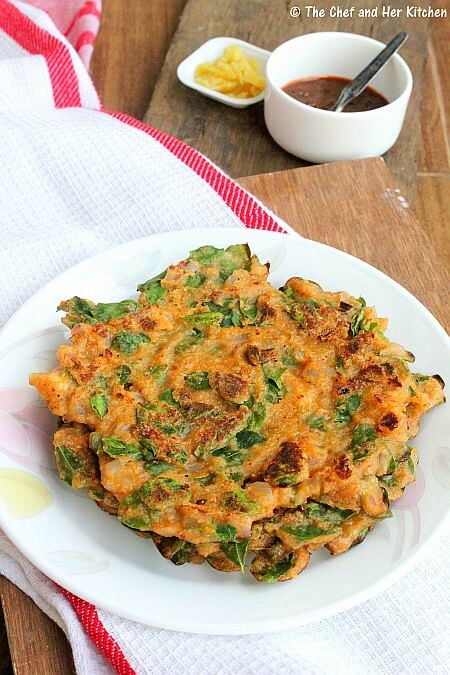 You can even grind onion along with rice but I prefer adding them to the batter which gives a nice crunch. Asafoetida adds a nice taste to adai,use the required quantity according to the quality of asafoetida.In generally the rock variety is more stronger than the powdered variety. 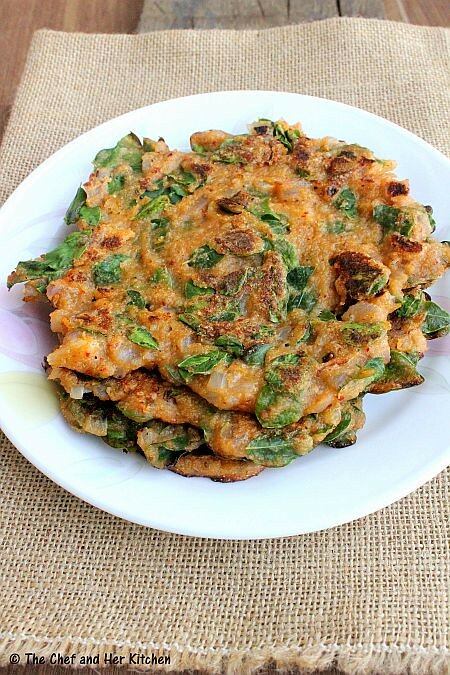 Drumstick leaves Adai looks healthy and delicious..
A lovely recipe! Looks so delicious! Ur new template looks simply awesome Prathy, adai looks healthy and nutritious. Looks beautiful. I just cannot take my eyes off the adai. we make something similar with drumstick leaves. We call it uppu-huli dose in Kannada. Tastes amazing!